Parents shouldn't feel guilty about letting their kids play games on their mobile phones -- especially if they're educational ones. That's one of the main conclusions in the recent study released by the Joan Ganz Cooney Center, "Learning, Is There an App for That?" 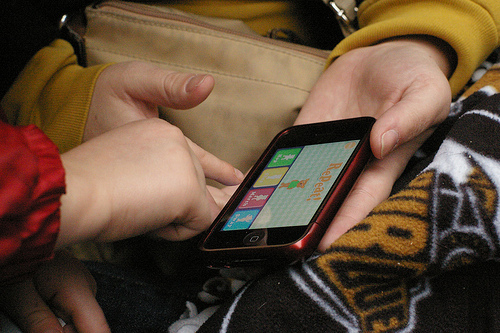 The report uses information from three quantitative and observational studies conducted by the Center in conjunction with PBS Kids, Sesame Workshop, Hotspex Survey Research and Rockman, to document for the first time the design, development and research issues related to the use of educational apps for young children's (preschool and primary age) learning. Most parents know to moderate the amount of time kids spend with the gadgets, and with the help of these kinds of studies, can readily find out which have protein and which are just empty calories. 1) They're interactive. Touchscreens beg for touching. 2) They're designed for shorter playtimes. 3) They're focused narrowly by age and relevant to what they're learning and their motor skills. 4) They're fun, engaging children by making them laugh -- but too too much. 5) They're inter-generational, allowing a way to involve parents. 6) They're modifiable, giving kids options to personalize. 7) They have built-in goals, to keep kids coming back with incentives. As a parent, I was heartened to learn that parental involvement is important, too. Having a parent as a playmate, especially for the younger kids,seemed to motivate children to keep playing. Adult playmates provided scaffolding and extra prompts to help their children understand the material. They also helped to reinforce the materials in activities undertaken outside of the app. The study concludes overall that when they're designed well, children can learn a lot from educational apps. As the report states: "The challenge now is how to carefully target pressing educational needs tied to literacy, numeracy, and scientific inquiry in the early years, consider the distinct potential of mobile apps, and confidently respond, 'Hey, there is an app for that!" In my next post, we'll hear from the studies' authors about its implications.